We are over the moon to announce that we have enlisted with the #G2Army by becoming an official partner of the G2 Esport CSGO team! We are no stranger to working with pro teams. In the past, we’ve sponsored teams like Na’Vi and Flipside as a way to get more involved in esports and to work with organizations that have similar beliefs such as high levels of professionalism, credibility and most of all a desire to win. To celebrate our partnership with G2, we are lining up some exciting contests and prizes throughout the partnership term. We urge everyone to follow us and G2 on Twitter to receive updates on what we have in store! With a lot of changes at the top of HLTV’s ladder, such as Cloud9’s major win, Mouseports’s StarSeries4 win and Na’Vi’s 2nd placing at StarSeries4, G2 is ranked 7th. The team is comprised of an all-French lineup of shox, kennyS, NBK apEX and bodyy. In 2017 they managed to win the ESL Pro League final as well as DreamHack Masters Malmo. ESP was founded in 2014 and began offering fantasy esports to their members as a free to play site. In July 2017 we added the option to pay to enter fantasy tournaments. 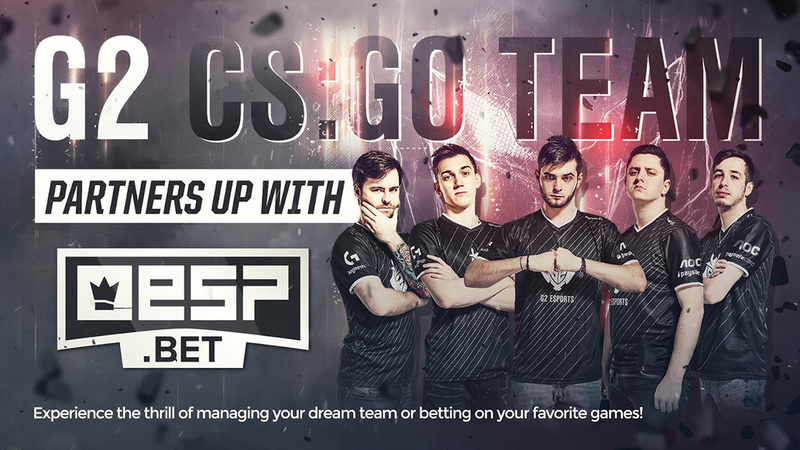 We have since extended our product to allow our members to wager on esports matches in the form of pool betting, and also to live betting where members can watch and bet on the outcome in real time. For a CSGO match, ESP members can bet on events that happen on every round of play. As participating members in ESIC, we take security and gambling responsibility seriously. We do not accept wagers from non-adults and we do not offer our paid product in countries where it is deemed illegal. We run a rigorous policy of age verification before any action begins.